MOBILE, AL - JULY 25: Adrian Clemons applies lip balm before practice with his dance team, The Prancing Elites. The team has been asked to perform at the Nappie Awards, an award show put on annually by Lagniappe, an independent bi-weekly newspaper in Mobile, AL. Since a video of team dancing at an LGBT basketball game went viral after being tweeted by former NBA star Shaquille O'Neal, the team has gained semi-celebrity status around Mobile, has been flown out to Los Angeles to appear on a tv talk show, and is currenly looking to star in a reality show about their lives. The Prancing Elites are a group of young, gay, black men who practice J-Sette, a form of dance birthed at Historically Black Colleges that is characterized by sharp, cheerleading-style movements and hip-hop performed to an eight-count beat. 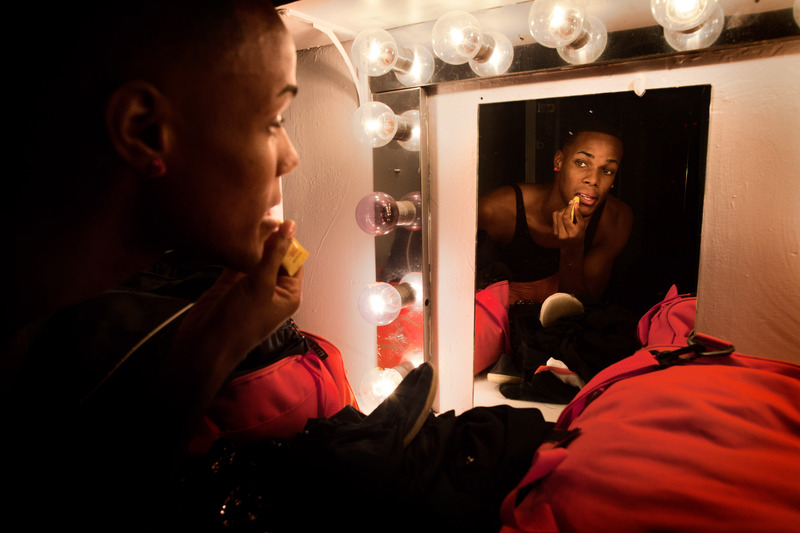 Traditionally, men cannot join college dance teams, so young gay black men have been forming their own J-Sette "lines," organizing competitions, and creating their own outlets to practice this type of dance.